Phoenix will ensure that you’ll get the most from your investment. We will work together with our partners to provide a complete automation process with the latest robot simulation software technology, we will analyse your robotic system needs, provide a plan for automation, and put the automation into production. 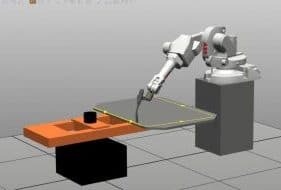 Robot Simulation is a proof of design that the robotic system will perform the operation without any problem. Consult with your robot integrator if your project require a simulation or if you require any specific simulation software for your operation, but make sure to ask before anything is installed on the floor plant, it maximises the return on investment. Some companies require their own CAD/CAM software package while others just require a simulation to reduce the risks of the integration. CAD/CAM robot software solve complex design and machining problems. Robot simulation software is making industrial robots accessible to the all industry and they are also increasingly their used for all applications and market leaders in the aeronautical industry, and even in nuclear reactors. 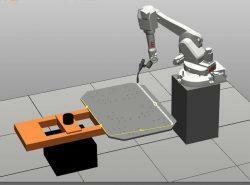 All robot manufacturer have their own robot software package such as KUKA|prc. Phoenix, as a robot integrator, will provide a complete integration package or robot simulation if you require it. Certainly, a proper robot simulation ensure user’s are receiving the robot integration system for your application. Today’s market robot sofware capability is becoming cheaper and helping companies to stay more competitive. Phoenix offers both options, we provide bespoke simulation in our robot automation projects. Contact Us for more information. If you want to deliver on the robotic promise of reducing costs while improving margins and productivity, we have the skill and determination to help customers complete their projects on time. To discuss how we can give you a cost effective robotic’s solution, call us on +44 (0)1235 823120. Phoenix Control Systems Ltd. provide you with the latest simulation technology. Robot Software simulation and programming will help you to save money and time. We can guide you through the complete process to deliver the best automation solutions to your business. If you need any assistance in any area regarding automation and robotics, please do not hesitate to contact one of our Consultants to discuss your project or to arrange a meeting at your premises.